THE RUNAWAY - COMING SOON! The search for a teenage runaway sends her foster mother, a psychologist working for the LAPD, on a dangerous journey through Los Angeles' criminal underworld, in this gripping new thriller by the author of the international bestseller Baby Doll. You'll do anything to protect her. But you'll have to find her first. When LAPD forensic psychologist Becca Ortiz agrees to foster teenage runaway Ash, she knows she will love and protect her as her own daughter. Ash may have turned her back on her old life on the streets, but there is still one person who she can't bear to lose. Now he is about to drag her back into a dark world where nothing and no one is safe. How far will Becca go to save her daughter? And can she find her before it's too late? THE WALLS - ON SALE NOW! WOULD YOU KILL TO PROTECT YOUR FAMILY? Working on death row is far from Kristy Tucker's dream, but she is grateful for a job that allows her to support her son and ailing father. When she meets Lance Dobson, Kristy begins to imagine a different kind of future. But after their wedding, she finds herself serving her own life sentence---one of abuse and constant terror. But Kristy is a survivor, and as Lance's violence escalates, an inmate plants an idea she simply can't shake. Now she must decide whether she'll risk everything to protect her family. Does Kristy have what it takes to commit the perfect crime? 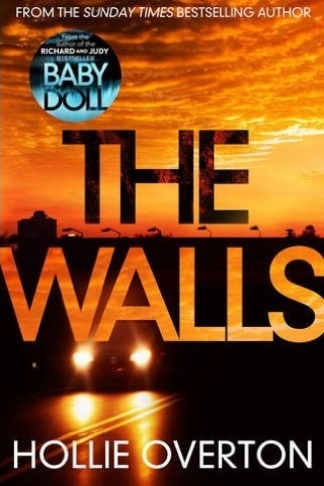 THE WALLS is a heart-stopping novel of suspense, by the author of the international bestselling thriller BABY DOLL. Held captive in one room with her six-year old daughter, mentally and physically abused every day, since she was sixteen years old, Lily Riser realizes one day that her captor has left the door unlocked. For the first time in eight years, Lily’s free. Reuniting with her family including her identical twin sister, Lily finds the courage to bravely identify her captor, a man no one in town could have ever expected. Determined to bring him to justice while trying to reconnect with her family will have Lily struggling to reconcile the life she has now and the one she left behind. Baby Doll is a taut psychological thriller that focuses on family entanglements and the evil that hides behind a benign façade. Hollie is currently working on her second book for Red Hook and Penguin Randomhouse UK, a thriller set against the back drop of Texas's death row. New York Times bestselling author Tess Geritsen is raving about BABY DOLL – "What a compulsive read. A brilliant first novel that kept me transfixed and entertained until the very last page."